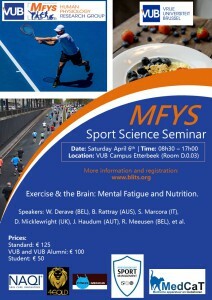 The MFYS Sport Science Seminar will be held in Brussels, Belgium, on the common VUB campus Etterbeek. The event will take place on April 6th, 2019. We expect 200 participants from different fields (scientists, athletes, coaches, sports federations, nutritionists, physiotherapists, sports medical doctors, psychologists, …).